Up Mommy Creek: On Being a Super-Mom...or Not. 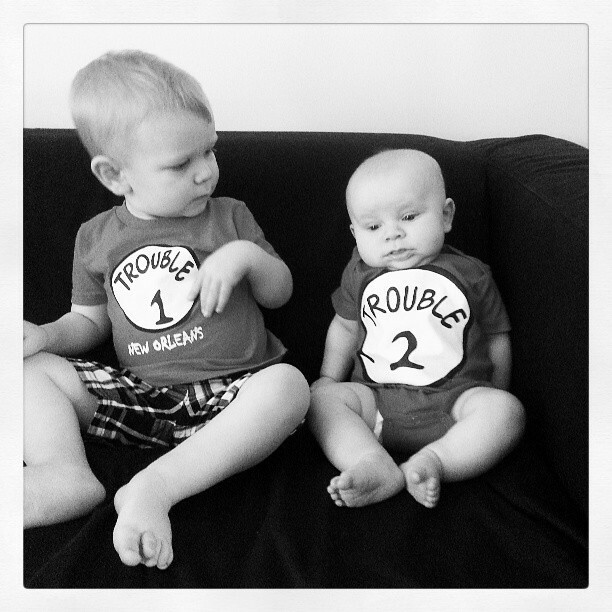 Being a mom to 2 boys under 2 has been interesting to say the least. It's a crash-course in multi-tasking. If I wasn't a good multi-tasker before, then I have to be one now as my sanity relies on it. But I think I have developed a pretty successful strategy. Let's work through an example. Situation: Toddler is crying because he is hungry. Baby is crying because he is hungry. House is a mess. Dinner needs to be made because adults will be hungry. Kitty is running around like a maniac. Mom is losing her sanity. Step One: Assess the situation You need to prioritize which screaming/crying/tantrum is most urgent, and then attend to that kiddo first. In this situation, I can hope that Toddler is probably open to some sort of reason. I first try and appease him by giving him the apple he is asking for. If I am lucky, that is the end. I'm never lucky. Step Two: Damage Control Most of the time the simple solution of giving my toddler what he wants just results in me not actually grasping what he really wants. For example, he asks for an apple. I assume this means he would like an apple. I am a fool. What he really wants is an apple, but only after being offered 3 other things, and then he wants it cut in a certain way, in his blue bowl and sitting in a certain section of the kitchen. While I try and discover what the magic routine is this time, I let him have his little meltdown and attend to screaming Baby. Step 3: Neutralize one of the threats to sanity I feed Baby. This is an easy fix, and I am pretty much guaranteed he will be super happy afterwards for at least 10 whole minutes. Step 4: Return to the original problem and re-attempt damage control By this time I can usually hug the toddler and help him calm down. We can then reattempt the apple-giving and he will usually concede at least 1 of the requests (perhaps this time I can use the plate instead of the blue bowl) and be content. Step 5: Accept the things you cannot change I know I cannot make Kitty sane. I also know I cannot keep my house clean. It's best to just abandon all hope that these things will ever be accomplished. Step 6: Attempt the task you need to get done Yesterday I actually was bouncing a bouncy-chair with my foot while baking muffins and keeping an eye on my toddler. This actually happened. For a second I felt like a pro. I mean, look how amazingly I am multitasking! 3 things at once! And muffins to boot...that's like Martha Stewart stuff right there. Then I remembered I hadn't showered in 2 days and my house looked like a bomb containing toys, food crumbs and random kitchen utensils had exploded. See step 5, and then make dinner. Step 7: Once the kids are in bed, attend to your sanity Pour yourself a huge glass of wine, or cup of coffee or hot chocolate. Pat yourself on the back and say "Congratulations Mommy. You made it through another day." It's learning every day! You're an awesome mama! This post was hilarious! Love it! How true! I find myself running around in circles most days, never having a complete thought or finishing a task. Don't even get me started on the crumbs on the floor or the dust on in the corners! I too was a mom of two under two until recently (they are 21 months apart)! So hear you on this post, so there as well. Mine were born in April 2011 and January 2013. Now that my Q (that's what I call my second on my blog too but she's a girl) is crawling it's even crazier. Have had to be better about floor cleaning as she is all about putting things in her mouth. Found your site off the top 25 Canadian moms voting list (and voted for you by the way. Good luck:) My hubby knows it's one of those days when he gets the text to pick us up from the park - me, the kids, and my "to-go" mug!